Setting: USA, first the east coast, but soon heading west. Notes: Misha is a recent immigrant, so his English is not standard; in fact, the writers have given Artie and Ignacio poor English too, to show a lack of education. (I haven’t fixed their speech, so I hope English-learners can figure out what people are trying to say!). This movie uses the “flashback” technique to tell a story, so it starts near the end, and then goes back to tell us Paulie’s story. A partial preview (to help you understand what you will see). Paulie starts as a gift to a little girl (Marie), who stutters; Grandpa thinks that she needs “someone to talk to.” But Marie’s parents couldn’t deal with Marie’s stuttering problem, and they sell the bird, who has his heart set on getting back to Marie if possible someday. Paulie has several owners, including a Pawn Shop owner, who sells him to an elderly lady (Ivy). 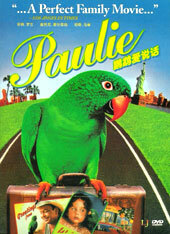 Paulie helps Ivy after she goes blind, but eventually flies across the USA to Los Angeles. There, he falls in love, works at a “Taco stand” and then later (unknowingly) for a thief. When caught, Paulie ends up at an Animal Research Institute. But the top scientist breaks a promise to set Paulie free, and then locks the bird in the basement. A new janitor finds Paulie, hears about his adventures, and sets out to reunite Paulie and Marie. chimney: a pipe that allows smoke to go up through the roof of a house, factory, etc. *fantasy: a type of story based on imagination, featuring magic or unusual worlds, creatures, experiences, etc. *janitor: (AmE) the person takes care of a large building, cleaning it, changing lights, opening/locking doors, etc. 1. Misha and Ignacio were immigrants. Tell your partner why you think they moved to America, or why up to a million people per year try to make America their permanent home. 2. In Russia, Misha was a teacher. In America, he took a job as a janitor. Explain why he had to take this low-skill, low-pay job if he had been qualified as a teacher in the past. 3. Do you think you would ever accept a job that paid less than your previous job? Explain why or why not. 4. In dialog 7, Paulie says: “Marie couldn’t talk. The dad couldn’t listen. The mom couldn’t cope. So they got rid of me.” Explain the first sentence to your partner; your partner will explain the second sentence, and so on. 5. Read dialog 11. What do you think is more important: a destination, or getting there? Explain your answer. 6. In dialog 13, Paulie says, “But the real thing Ivy taught me is you gotta live like there may not be a later.” Can you think of something you want to do “later”; when do you think you will get to do this thing? Should you try to do it sooner? Why or why not? 7. In dialog 15, Misha describes the kind of woman he wants to marry. Tell your partner about the qualities you want in a future husband of wife. 8. In dialogs 18 & 19 we see that there was no “legal” reason to return Paulie to Marie, and after all, Paulie was just a bird! If they could study Paulie, maybe they could make other animals talk—wouldn’t that be a good thing? Do you think Dr. Reingold should have done something differently? What and why? 9. In the end, Misha lost his job and had to break the law in order to return Paulie to Marie. Did he do the right thing? Most people would not sacrifice their job for a bird; what would you sacrifice your job for? Explain your answer. Virgil: The agency told you you had to pay for your own uniforms, right? Misha: Yes, I to buy with money from job. Virgil: No, no, no. You can't start the job without a uniform. Misha: But how to buy if not been paid? Virgil: You don't have any money? Misha: No. This is why I take job. To make money. This is why I come to America. To be big shoot. Virgil: [You mean] “Shot.” Big shot. Misha: I try not to live in past. Only present tense since I come to America. Virgil: [chuckling] Yeah, but "big shoot" makes no sense. (Virgil shows Misha around the facility.) This is the main building. Administration, lecture rooms and laboratories. Don’t worry about the cages or what’s in ‘em [them]. The research assistants feed them. You know, they study animal behavior. Misha: In cage, only can behave like prisoner. Virgil: A word of advice, my man. Try not to think so much. And whatever you do, don’t bother the professors. They’re the real “big shoots” around here. (They enter the basement.) This is purgatory. Misha: What kind bird is this? Misha: Are you bird or dog? What he’s doing down here? Virgil: Paulie’s an old project for Dr. Reingold. Didn’t work out. Loss of funding or something. I can’t remember. Misha: But he’s not eat, I think, and he lose his feather. Virgil: Don’t worry about him. Come on. I’ll show you where the incinerator [trash burner] is. Misha (to Paulie): Great. Now we’re both in trouble. What is problem with you? You know, maybe they should stuff you, scoop you out, fill you with foam and glue you to fake tree. You’re lonely, I think. I am lonely. In Russia, I was teacher of literature. In America, I am cleaner of bird crap. I miss words. I miss my language. I just would like someone to talk to. Paulie: I said, join the club. Misha: So I’m not crazy. You CAN talk! Paulie: Of course I can talk. Misha: Then why you not? Paulie: Because talking just gets you into a lot of trouble. Misha: Trouble? Why you say that? Paulie: It’s a long story. Misha: I'm Russian. I like long stories! Paulie: All right, Chekhov, sit down. (sighing) It all started with Marie. Marie (to Paulie): OK. You are the fairy godmother. I am the p-p-princess. We live in a big castle, and I have lots of p-p-princess dresses. OK, fairy godmother. M-M-Make me talk right. A-A-And p-p-please hurry. 4. Paulie: I was quiet. I’m sorry I was, but I was afraid of him. And that’s not all I was afraid of. Misha: You were afraid to fly? Paulie: I was afraid of heights. That is, until I learned a new word. Paulie (remembering that Marie’s dad gave her a cat): I had no idea what that thing was, but something deep inside told me it was hazardous to my health. 5. Dad: I don’t think she can tell the difference between fantasy and reality. Mom (not happy): Come on. Dad: You know what she said? Are you ready for this? She said the bird told her the cat started it [started the fight]. Mom: She said that to you? Well, she’s five years old. It’s her imaginary friend. Dad: She doesn’t have any other friends. She hasn’t made any other attachments. I really think that we should consider getting rid of the bird. Mom: I don’t know, Warren. She loves that bird. 6. Marie: You have to learn how to fly, Paulie. Paulie: No. I don’t want to! Why? Marie: So in case you ever go away, y-you can fly back to me. We h-have to be together, r-right? Marie: Then fly! Don’t look down. You could do it! Paulie: If it’s so easy, then why don’t you do it? 7. Paulie (to Misha): Marie couldn’t talk. The dad couldn’t listen. The mom couldn’t cope. So they got rid of me. Misha: So they bring you here? Paulie: No, it wasn’t that easy hitting rock bottom. I did a bunch of things. First I did a stint as a window display in a place called Bloomingdales’s (Department Store). And I was in a brochure for Costa Rica. I did some work as a magician’s assistant doing children’s parties, but when Zintar fell on hard times, he had to choose between me and the cape. Guess which one he pawned? 8. Artie (the pawn-shop owner), offers “ten bucks ($10)” to Benny for a stolen radio, mainly trying to get this dishonest guy to go away. But Benny tries to argue so Paulie speaks to him. Benny: That’s cute. Do you train the bird to insult your customers? Paulie: No, I could tell you’re ugly all by myself. Benny: How’d he do that? Benny: What an angle. I could see how his unique skills could really come in handy to an intelligent guy, huh? Paulie: Yeah, I’ll let you know when I see one. Benny: How much [do] you want for him, Artie? Artie: A lot more than ten bucks, baby. You’d have to grift for more than a year to make his numbers. Artie: Very funny, toots. What do you got there? Ivy: Oh, this is my easel. It’s a very fine one. My late husband got it for me, and I really hate to part with it, you know? Artie: Yeah, whatever. Dead husband aside, do you wanna pawn or sell? Paulie: The real question is: Are you prepared to throw in that potholder on your head? Ivy: Well, that was extremely rude. Did you teach him that? Benny: No. That’s the thing. The dirty mouth is all his. Paulie: What are you looking at? Ivy: You know, I think I’ll take him with me…. Somebody has to teach this beautiful bird some manners. Might as well be me. Paulie: Why does your house have wheels? Ivy: Houses are cheaper with wheels. Paulie: I was thinking more along the lines that houses with wheels can go places. Ivy: Well, not anymore, I’m afraid. Earl and I used to travel all of the time, you know? But things change. He had even crazier ideas than you have. We always used to talk about going to the Grand Canyon, but we just never got that far. You know, Earl said that if you stand right at the edge just when the sun comes up, it's like seeing the first sunrise in the whole world. Paulie: He was kind of poetic, wasn't he? Paulie: Hmm, you miss Earl…like I miss Marie. Paulie: I thought flying was scary - until I drove with Ivy. Now, that’s scary! …Ivy was a great teacher. She was a philosopher, an explorer. Unfortunately, she also thought she was a singer. Paulie: (Ivy has been singing for a while…) Ivy, please. I'm a bird. I have a small brain, and it's about to explode. 11. Paulie: So, when will we get there? 12. Paulie: For all of her “pleases” and “thank yous,” words weren’t really that important to Ivy. It’s what she saw that mattered. Seems to me, the way it works out, it’s the things you love most that are the things they take away. 13. Ivy: You know what you are Paulie? You're my seeing-eye parrot. You've been a dear friend to me Paulie. We're birds of a feather, you and I. Betwixt and between, that's us. So what do we have tonight? Is it pretty? Paulie: Oh, very pretty. There's more orange now, and it's getting darker. Just a little gold left. Ivy: The sun must almost be set. Can you see any stars yet? Paulie: Not yet…. (Then we see an ambulance next to the camper.) And then one day, the cat got her (i.e., Ivy died). There are things in life you put off, because you think you're gonna do them later. But the real thing Ivy taught me is you gotta live like there may not be a later. (So Paulie decided to try to fly, and it worked! He flew to the Grand Canyon.) I found a tree, and I spent the night. 'Cos [because] I wanted to be there in the morning... for the very first sunrise. 14. Ignacio: Hey you, come on down here. OK, what’s your story? Paulie: Uh, yes. Uh, I’m looking for someone named Marie Alweather. But I’m afraid I may be lost. Can you tell me where I am? Ignacio: You’re in L.A. East L.A.
Paulie: L.A.? L.A.! Oh, my gosh, I made it! I don’t believe it! Ignacio: I don’t believe it. You can talk? Ignacio: Sure, they’re OK. I don’t know about me. I’m talking to a bird. Misha: Women can be tough. Paulie: Tell me about it. So, how do you know if you’ve met the right one? Misha: Well, for me, let me see. She would be pretty, but smart. She would have books on her table and flowers in her hair. Paulie: And lots of golden feathers. Misha: Well, yes. Important to have high standard. Paulie: So, Misha, [have] you got a girlfriend? Misha: No. Well, once. A little bit. Paulie: What? How do you have “a little bit” of a girlfriend? This is interesting. Go on. Misha: Yes. She marry my best friend. He told her how he feel. At wedding, she take me aside and say, “Misha, I always liked you best, but I was afraid of your silence.” It is important to speak up. 16. Paulie: You know how it is. [As] Soon as you think you landed on easy street (i.e., you’re OK), the past comes back to bite you in your tail feathers. 17. Benny called the “cops” (police), telling lies to get them to come to the Taco shop. When the police arrive, everyone runs away (maybe because some are “illegals”--illegal immigrants--or because the restaurant does not have the right kind of business license), and in the confusion Benny steals Paulie. Then he promises to help him find Marie if he will “help him”; Paulie doesn’t know that Benny is a thief until after he gets caught. Dr Reingold: So, you say he flew down your chimney. Grandpa: That’s what he told me. Dr Reingold: (laughing) Well, many parrots have quite extensive vocabularies, but there’s a difference between cognizant speech and parroting. Grandpa: He keeps talking about a “Marie Alweather.” I think she might be his owner. Dr Reingold: Well, that’s not unusual, either. Lots of people train their birds to repeat names and addresses in case they get lost. I’m sure that’s the case. Paulie: Do you have a phone book? Please. Dr Reingold: I’m sure that’s just a trained response. But I’d like to keep him here a few days and maybe run some tests. Build him up a bit. He looks a little undernourished. But don’t worry. You did the right thing bringing him here, Gerald. We’ll take good care of him. (Grandpa leaves, and Dr Reingold starts talking to Paulie.) I want you to understand what it is we do here. Mostly we just listen and we watch. You see, there’s this gap between animals and humans. And the gap is called speech. Now, if that gap could be bridged, we could truly understand each other. Won’t you consider helping us? Tell you what. I’m gonna have you moved out of here tonight. And I promise you, I will take you to see Marie when we’re done. 19. Paulie: I told you, talking just gets you into trouble. Misha: No. It’s not that. It’s how you say thing. You have to be careful. Woman say, “You like my hat?” You say, “No, it makes you look like floor lamp.” You get punch [hit] in nose. Paulie: I got worse than that. If you don’t want to know what happens at the end of the movie, stop reading here! 20. Misha: I think this is the one (i.e., Marie’s house). Paulie: It’s her! Misha, it’s her! Misha: Now I can’t breathe. Marie (to Misha): I can’t thank you enough. Misha: You’re welcome. So, I will go now. Marie: Oh, no. Please don’t rush off. Won’t you come inside? Misha: No, it’s OK. You will have much to talk about. Goodbye. Goodbye, Paulie. Paulie: Misha, where [are] you going? She has flowers in her hair. I bet she has books on her table. Marie: What is he talking about? Misha: I’m not always sure. Paulie: Misha, don’t be afraid to speak. Marie: I’d love it if you stayed. Misha: You know, I would like that. I would like that very much. Marie: Paulie, how did you find me? Paulie: Well, It's a long story. Misha: [chuckling] It’s the only kind he knows. 2009 Michael Krigline. As far as I am concerned, people are allowed to print/copy it for personal or classroom use.